Elected officials call on Jews not to take law into their own hands despite rampant stabbings, firebomb attacks. 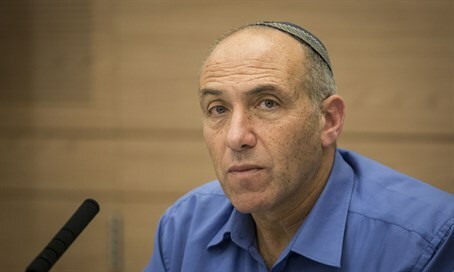 Jewish Home MK Moti Yogev cautioned Jews not to take revenge for an unending slew of Arab terror attacks against Jews on Friday, after four Arabs were stabbed in Dimona in an apparent revenge attack. "In these days of increasing terrorism, we will remain alert but not be deterred - not in Jerusalem nor anywhere in Israel," he said. That said, he cautioned Israeli Jews not to take drastic measures against the rise in terror. "Under no circumstances will we take the law into our hands to harm Arabs - only when it's life-threatening," he said. "We will strengthen the government and security forces to allow them to act with determination to eradicate terrorism and restore deterrence and security nationwide." Agriculture Minister MK Uri Ariel (Jewish Home) agreed. "If this was indeed a revenge attack, this is a very serious incident which should not happen," Ariel said, congratulating security forces on swiftly apprehending the attacker. "The difficulties of recent days have been understandable, but it does not justify acts of revenge as such." Other politicians used the opportunity to reignite political tensions, however, with Meretz chairman Zehava Gal-On blaming a variety of government institutions and officials for the revenge stabbing. "Whoever stabs innocent people on the street is a terrorist," Gal-On stated. "This is exactly what an encounter between racism, fear, incitement, violence and a feeling that there is no responsible adult here looks like." Gal-On implicated both Liberman and Jerusalem mayor Nir Barkat in inciting the stabbing. "That's how it looks when the mayor of the most explosive city in Israel urges citizens to bear arms, as Avigdor Lieberman calls not to buy from Arabs, when the government and the police do nothing in the face of terrible racism over the past few days," she added. The Israeli public's frustration has been mounting, after no less than seven stabbing attacks in the past 48 hours alone - and hundreds of rock-throwing and firebomb attacks being reported on a daily basis. Prime Minister Binyamin Netanyahu and Defense Minister Moshe Ya'alon (Likud) have so far responded by toughening measures against terrorist offenders, including changing the rules of engagement for police. However, they have declined from ordering a wide-scale operation into the Palestinian Authority (PA) ruled territories to stop the attacks, claiming that "we have dealt with worse times," and simply calling on the Israeli public to be "resilient."